Ayala said that Clifford Scott Jr. shot him three times on the morning of Oct. 27, 2012. Ayala testified that bullets hit him in the abdomen, forearm and thumb. During the shootout, Ayala was wearing a bulletproof vest, which authorities credit with saving his life. Two other CHP officers who arrived at the scene at the conclusion of the shootout testified Thursday that they found Ayala lying on the ground covered in blood. The shootout occurred after Scott fled from a traffic stop at nearly 100 mph, crashed his car on 13th Street in Paso Robles and hid in a dumpster. Ayala located Scott and ordered him to get out of the dumpster. When Scott rose from the dumpster, he began shooting at Ayala with a handgun. Initially, Ayala only had a taser to fire back. But, he grabbed his handgun while evading bullets and fired shots at Scott until he fell to the ground. Scott, 23, survived and is standing trial for attempted murder of an officer. 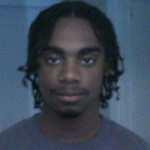 If president Obama had a son he would look just like Clifford Scott. Glad you said it this time..
WOW. Ayala, went on a chase all alone and didn’t have back up when he found the perp and told him to get out of the trash can and didn’t even have his gun drawn when doing so. I bet he won’t do that again, talk about a hard way to learn. It’s so infuriating to see people like Scott running around out there. His kind make up less than 1% but it’s exactly his kind that makes cops paranoid, rude and distrustful. At least he (Scott) won’t be back on streets for a long time, if ever. It would be interesting to know what his rap sheet has on it, no doubt it’s considerable. Less than 1%? San Luis Obispo County is at 275,000 so less than 1% would be less than 2,750 people like that. That being truth, everyone should be paranoid, rude and distrustful. Sounds like the CHP took a chance to avoid a pile of paper and almost became a tenant under a pile of dirt. Thank you CHP for your bloodletting and a safer public.